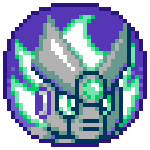 Finally, it's time to make a thread and show the sequel to NSMW1 the 12 Magic Orbs. 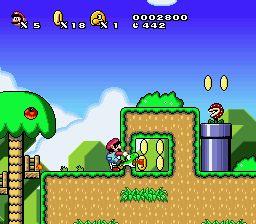 One year after saving the 12 magic orbs, Mario decided to take a vacation on a planet called Aeonia(name not final), named after it's biggest treasure, the Scepter of Aeonia, after returning to the Earth, Mario discovers that Tatanga stole the scepter after hearing about it's powers and decided to take over the planet and after that, creating he large spacial fortress called "The Grandread Destroyer", which will destroy the Earth. 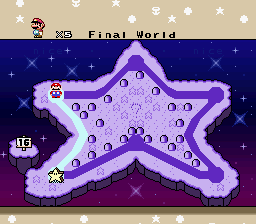 Yeah, this hack is going to have 16 Worlds, each world will have 6 levels and 3 of the worlds are secret. 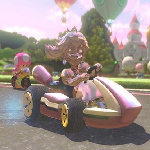 This is a short hub and tutorial level. That's all from now, i will see if i can release a short demo for c3. Well, well, G.D., I expected something like a sequel from your hack, as it was quite a piece of art. The new maps you design are well thought; no palpable issues seen. As the hub... pretty simple. 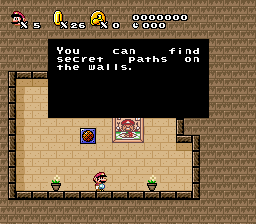 I liked the secret passages design. This hack surely looks promising. That looks kinda nice. 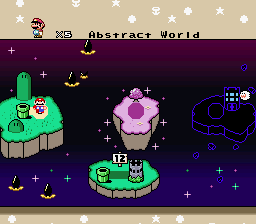 I can't say that much about that hub level besides it looking neat and it seeming to be a nice and complex tutorial stage. Woah! 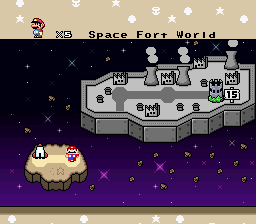 16 Worlds. That is huge! But since you managed to fit 12 worlds in your first hack I think that shouldn't be as much of a challenge for you. 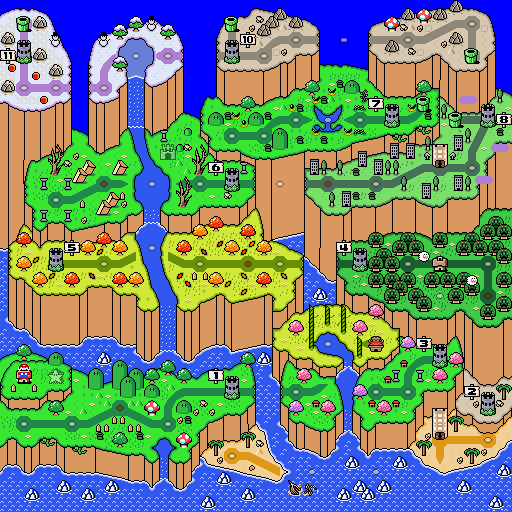 The lower portion reminds me a lot of the first two worlds from NSMW1. 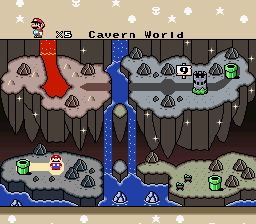 And in the middle portion (World 6,7 and 8) it sometimes is hard for me to identify the world theme. 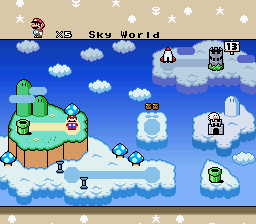 - World 3, is it just another grass world with 1 or 2 unique levels? 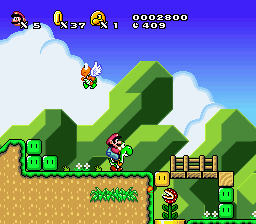 - World 14... It is hard for me to call it an actual planet. It just seems like a wasted, industrial area. That was way longer then I expected it to be. Maybe it helps improving the maps though? Can you use my ExGFX in your sequel Hack. 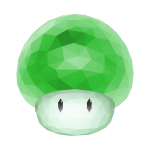 Anyways, those are some good graphics! 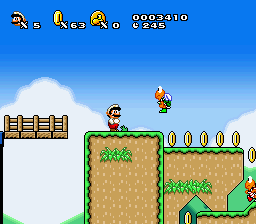 One minor problem, that yoshi coin on the HUD looks strange. Other than that, Everythings perfect. Not much to see right now design-wise, but I do really like the few screenshots you have posted so far. 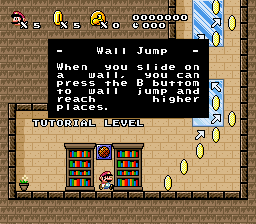 Tutorial levels can be really hard to handle without making them too annoying/intrusive, but it seems fairly well designed from what I can see. 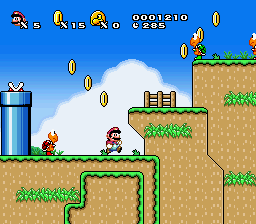 This is more of a personal preference, but the messages might not be needed - the coins and arrows are probably enough on the walljump part, and adding a few coins on that "hole" in the wall or making the graphics there slightly different would probably be enough on the secret paths part (really nice idea, btw - looking forward to see how you're going to use them). 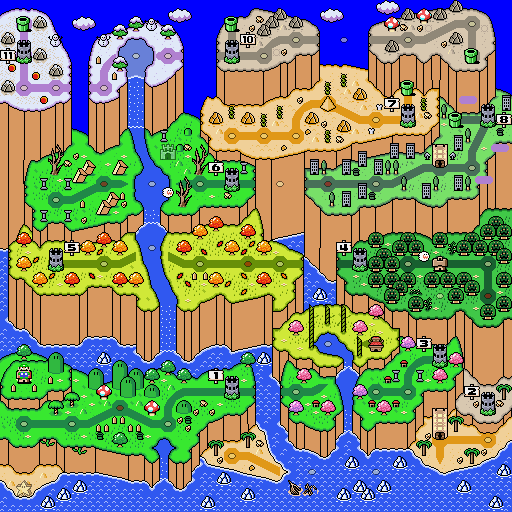 The overworld looks super neat overall, great job with the landmasses and decoration. It seems rather straight-forward for a OW that huge, though, which is slightly disappointing. 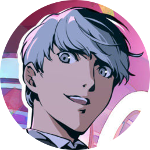 Some of the themes are a bit similar so I'm slightly worried about it becoming repetitive later on, specially with the huge amount of worlds. Other than that, it's definitely not bad! 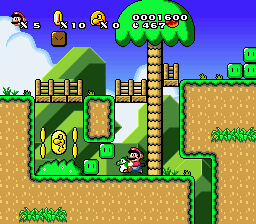 This is a pretty linear and simple level which introduces the basic enemies like koopas, goombas and piranha plants. So far that's the only level done(or not if the house counts) i'm not sure if one(or two) level(s) are enough for a demo. That fine. I use my ExGFX in my hack. Oh damn, GD. This is really good stuff here. Vanilla goodness. 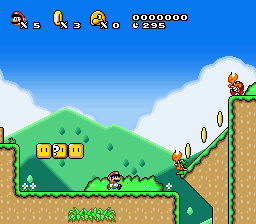 That status bar looks great (yeah, I know you didn't make it), the backgrounds look amazing, especially with those beautiful gradients; and the levels look fun. 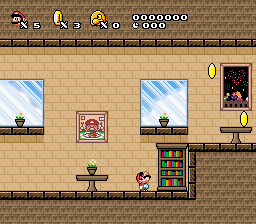 The pub level is cool, a good way to start off the player. The gimmick also appeals to me because it's safe and looks pretty neat. Good job, I'm excited to see how this'll turn out. I'm looking forward to this. I really enjoyed playing through your last hack. 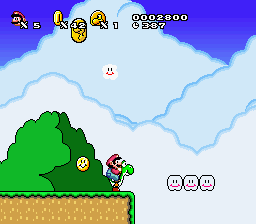 Also, are the custom power-ups making a return? but that's really lookin good there my friend. What M A R I O W O R L D said. 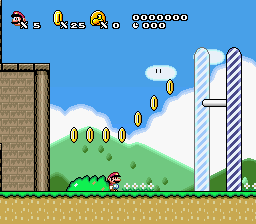 The level looks nice and the gimmick seems quite interesting. I can see a lot of potential for it if it ever gets used in a later level. 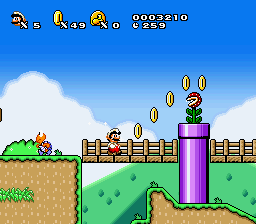 One thing that I noticed though: Yoshi is able to eat normal coins? That seems... interesting, to say the least. Nice stuff as usual! I really like the edible blocks gimmick here. 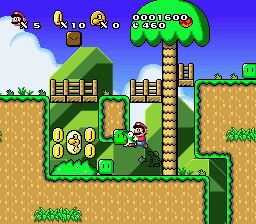 Making the coins also edible is an interesting choice as well, even if it doesn't change much (guess you could make something interesting with baby Yoshis, though). 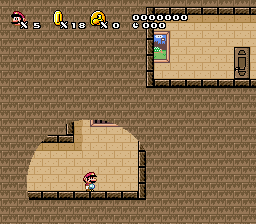 By the way, nothing big, but the black outlines on the first two screens are kinda hard to see against the background, they might look better recolored to white. 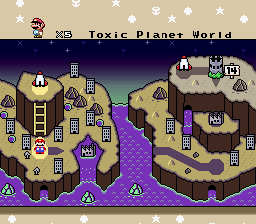 Oh sorry M A R I O W O R L D.
I don't have new levels to show now because i'm now working on the song i'm going to use on 1-3, after that i will work on the level but before that, i did like to show some changes on the overworld.